There is an entire movement of people who create that are refusing to use the word Craft to describe what they do. Instead, they are using the term “DIY”, which stands for “Do It Yourself”. Craft, by the way, means craft. It needs no explanation. I don’t understand. Why are people turning their nose up at the word “Craft”? 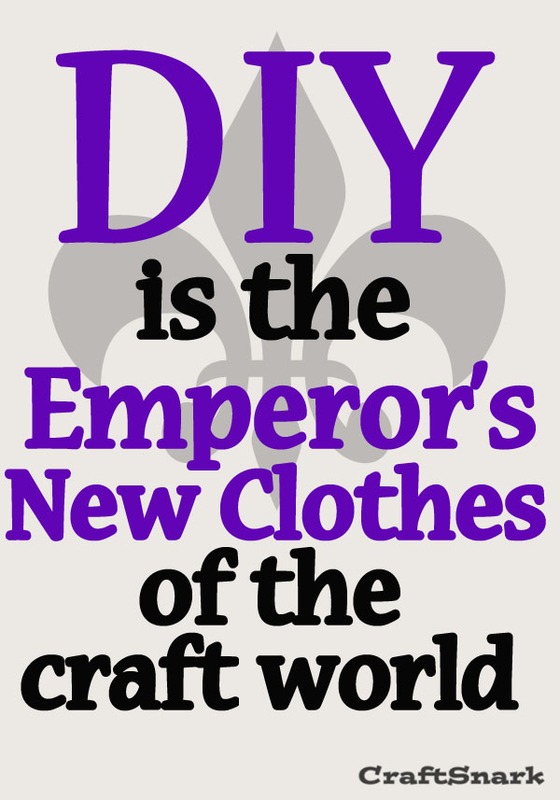 DIY is the Emperor’s New Clothes way of describing a creative person. The creative thinking here is that if they have to explain to you what DIY is, it must be fancier, and more important. It makes them sound special – a DIYer does something that you can’t understand without a Google search. DIY is like rocket science. I don't know what a rocket scientist does, but they must be pretty smart, right? The elitism of DIY over Craft is nonsense. Pure insanity. Over the next few weeks I’m going to delve more into this DIY vs CRAFT phenomenon with a series of weekly posts. Feel free to join along in the comments. Interesting...I always see DIY as the "I'm not artistic and polished enough to sell it" of Crafts. At least, that's how *I* use it. As in, this looked interesting but I'm not patient enough to keep doing it until it looks flawless, so I'll call it DIY. I use both pretty much interchangeably, and both proudly! David Rakoff has a lovely essay about crafting, making, being "handy," the value of it all, and a visit to the Martha Stewart Crafts department. I think it's in his book Fraud. There's also an audio version of it I heard on This American Life.